Mommy Thumb – Do You Recognize These Five Signs? You’ll learn how to recognize these signs in yourself or in a mom you love – plus an easy way to reduce pain from mommy thumb without injections or splints! Mommy Thumb is a painful condition of the thumb and wrist. Many recent news reports have highlighted this problem, which often affects new mothers. An older name for the problem is DeQuervain’s (dee-qwer-vain’s OR deh-qwer-vain’s) tenosynovitis (just means tendon lining inflammation). Your doctor may use either term. Some doctors call it tendonitis; others call it tenosynovitis – they are talking about the same thing. 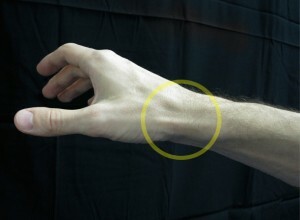 This is a condition which involves inflammation along the tendons that pull the thumb back (like a hitchhiker’s thumb). These tendons cross over from the back of the forearm, across the wrist, and onto the backside of the thumb. Patients can have pain anywhere from the forearm to the middle joint of the thumb. This can be a shooting or aching pain that gets worse with even light use of the hand. Why is it called mommy thumb? New moms get this condition because they lift their babies many dozens of times each day. When you lift a baby with your hands under her arms, your thumbs are usually pointed up and your fingers wrap around the baby’s back. This position stresses and strains the thumb tendons in the most forceful way possible, sometimes leading to irritation and inflammation of the tendon lining. Non-moms can develop this condition as well – usually by doing a lot of intense lifting that they’re not used to doing. For example, some patients I’ve seen with this type of tendonitis started having pain after helping someone move on a Saturday. An easy way to help with the pain – no doctor visit required! The key is to lift your baby with your palms up as much as possible. This position is called supination. It’s not always possible to do this with both hands, but alternating one hand palm up and the other in the usual position will reduce the strain on your tendons. Also, the more you can cradle the baby with your forearms, arm, and fingertips while relaxing your thumb (or wearing a splint), the less you’ll stress those tendons. Surgery for mommy thumb or DeQuervain’s tenosynovitis is done as an outpatient, under mostly local anesthesia, and takes about six minutes in the operating room. Recovery is relatively quick and takes away the problem forever in most patients. I’ve created a video to help you understand exactly where this is happening in your thumb and wrist. Dr. Henley recently did surgery to repair De Quervain’s tendonitis in my thumb. My only regret is that I waited so long to have it done! Dr. Henley and his staff at Ozark Orthopedics are professional, thorough and kind. The surgery was performed at the Arkansas Outpatient Eye Surgery Center. The staff there couldn’t have been nicer or more attentive – they helped make the whole experience stress-free. I had very minimal pain after the surgery and the recovery was remarkably easy. I am able to use my thumb normally again without constant pain. Thank you Dr. Henley! Do you have Mommy Thumb? What other treatments have you tried? Leave your comments below – if you have a question, ten other people are probably wondering the same thing! A new mom of a big 10 week old, I suddenly began having pain and stoping rungs. I’ve been icing, taking ibuprofen, and lifting my baby differently and that has helped. For me, however, the pain is in the cmc joint more than anywhere else. Is that a possible presentation of mommy thumb? What stretches would you recommend to help? I have had this pain for the past 8 months, since my child was born. I have not taken medicine for it, so it has progressed from being just painful to actually catching on that wrist bone and feeling tingly from it. Since I just got done nursing I may take the anti-inflamatories to avoid surgery. How frustrating. It’s possible, but usually tendonitis pain comes from stronger exertion and force than that. You’re right that any new activity has to be top on the list for causing the pain, though. i’m a beauty therapist and i do a lot of waxing. ive had this pain for about 3 months now. ive tried anti inflammatory tablets which didnt help at all or maybe i didnt use them for long enough. is there any specific anti inflammatory drugs that would work better by the way i used voltaren and would visits to an osteopath help? I didn’t know such a think existed, but I surely have it. My 10 month old son is 23lbs, and I was starting to worry about bones out of place or arthritis. I have had this pain for at least seven years. I have eight year old twins and I work as an EMT on an ambulance. It started out where it would hurt for three or four days then go away for a month or so. It has now hurt consistently for about two years. 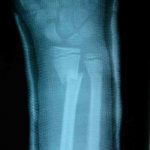 My doctor keeps insisting on xrays, only to tell me nothing is broken and to rest it and ice it. It affects everything I do in my daily life. Should I see some form of specialist? I need relief. Ice, rest and anti inflammatories no longer work. Beauty therapists do a lot of repetitive work! Sometimes trying several types of tablets (separately of course) may be necessary until you find one that works. I’ve never seen a patient who thought tablets worked for mommy thumb. Three months is a long time to suffer with this. I advise seeing a hand/wrist specialist. If you think you have this tendonitis, please see a hand surgeon. 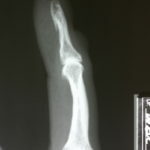 A cortisone shot can take care of this if the diagnosis is correct. Two years is a very long time to deal with this! I have been doing daycare and raising children since i’m 20. im now almost 50 and have been suffering the past 2 years with terrible pain.I did have pain when i started my daycare years ago. but it went away. Most everything i read on this website fits me. I did go to a hand specialist to recieve 2 rounds of cortisone in each of my thumbs. the shot only lasted 3 months or less. i don’t want to take inflamatory medication everyday. i have been taking so many natural herbs and vitamins. still no relief. is there surgery that i should look into? Really need help! I am a mommy of 5! Ages 6yrs to 9 months. I have been having issues on and off for years but over the last 6 months it has been constant. I am also a photographer and I especially notice intense pain after long shoots. I haven’t tried any treatment but upon self diagnosis think this might be my issue. Where should I start with self treatment or do I need to see a doctor? I gave birth to our second boy nearly 6 months ago, and I have been experiencing pain for almost the same amount of time. I don’t believe.I got pain like this with our first child, but with everything being so busy since the newest one came along, I have been lifting him in a hurry, and walking around cradling him in my arms. I am now wearing a brace, but plan on going to the doctor very soon. My wrist also seems to be catching on the joint, and this is extremely painful. Could that be happening? I developed my symptoms a day after I’d received a vaccination as I was traveling overseas, around 4 months ago now. How long do I have to rest my thumb in order to recover completely if I use a thumb splint? After reading your well written article I see that I need to see a specialist to eval my ‘daddy’s thumb’! The big question for me is how long is the healing time (restriction of wrist movement) after the release surgery? 3 weeks? 6 weeks? I’m a dentist and my wrist pain doesn’t affect my work but it affects me picking up my kids (I have 3 under 5y/o). I would hate to take 6 weeks off work, but it is what it is… Thanks Dr. Henley for providing this great information. Healing time is a relative term. You can use the hand right away if you can tolerate the soreness from surgery. You should baby the hand for a couple of weeks (3 ideally), but that doesn’t mean you’re totally bound up and restricted in a splint/cast for that whole time. Some folks have more soreness than others. Most patients can do clerical stuff and light gripping after 3-5 days. I wouldn’t advise picking up kids or heavy gripping for three weeks. Let me know if you need help finding a hand surgeon near you. Good question. I usually tell patients to use the splint for 6 weeks, try to wean out of it (use it every other day) over a couple of weeks if things are going well (don’t stop cold turkey). If you didn’t have a shot and it’s not better after 6 weeks of splinting – the shot should take care of it. Sorry I’m just seeing this. The feeling of your joint catching is pretty common with Mommy Thumb. The tendons can get caught and snap back and forth through the tight tunnel they run in, causing a snapping sensation. Hopefully you got some relief with your doctor visit. I hope this eventually calmed down. You can get a thumb spica splint on your own – just look online for these. I’d try just the splint for six weeks, then give up and see a hand specialist. I have a 13 week old baby. I had carpel tunnel during pregnancy. After her birth my hands were numb and tingly for like 4 weeks. I went to a orthopedist yesterday and got a cortisone shot. Its still really painful and bruised and my thumb is still slipping out of place. How long dose the shot need to work? I’m not sure about the thumb slipping out of place, but it takes 3-5 days for a steroid shot to start working. I’d give it 6 weeks before giving up that the shot will work. I also recommend my patients wear a night-time wrist splint while recovering from a shot. I dont have a baby but i have been experiencing pain just like “mommy thumb” would present is it possible to have “mommy thumb” if you don’t have baby? This is just tendonitis that can flare up in just about anyone, including guys and women without babies. Just like you can get tennis elbow even though you don’t play tennis. I just recently started having pain in my left hand. Side of thumb to wrist. Approximately for one week. I have peripheral neuropathy in both my hands with the middle, index and thumb tingly and some numbness caused from Chemo and radiation. I had 15 lymph nodes removed from under my left arm as well as a left mastectomy. It has been almost 3 years since the chemo. The only thing after watching your video and articles, is that I have a small dog for the past 2 years, who constantly wants to be picked up, and I do pick her up from the floor with my thumbs under her front legs. Could this have done it? It is painful, and seems slightly swollen in the wrist. Irene: From your description, it sounds like the kind of activity that can stir up this kind of tendonitis! I have a 20 lb baby that I am lifting all day long, so this makes a lot of sense. But my question is, does Mommy Thumb always involve wrist pain? My pain is just around the middle joint of my thumb. Almost always – it can shoot pain up and down the entire thumb on the top side. Bad Thumb Arthritis – What Does It Look Like?